ACK! I need a quick card for a blog post! I found this musical background in my “backgrounds” folder. Added some lovely green paper, and a “Be Joyful” sentiment in Silver Pearl embossing powder. Very festive, and very mail friendly, don’t you think? I can’t see musical notes and the word “joyful” together without thinking about the end of “Sister Act II: Back in the Habit” (1993), with Lauren Hill singing lead on “Joyful, Joyful”. Supplies: Stamps – Hero Arts, Simon Says Stamp, paper – Malmero Perle’ Sparkle Green, Neenah Classic Crest Solar White, inks – Stampin’ Up! Real Red, VersaFine Onyx Black, embossing powder – Ranger Silver Pearl, twine – MarkerPop. Categories: card, holiday | Tags: card, Hero Arts, Malmero, Neenah, Ranger, Simon Says Stamp, Stampin' Up!, Tsukineko, VersaFine | Permalink. I agree, definitely very festive and mail friendly. 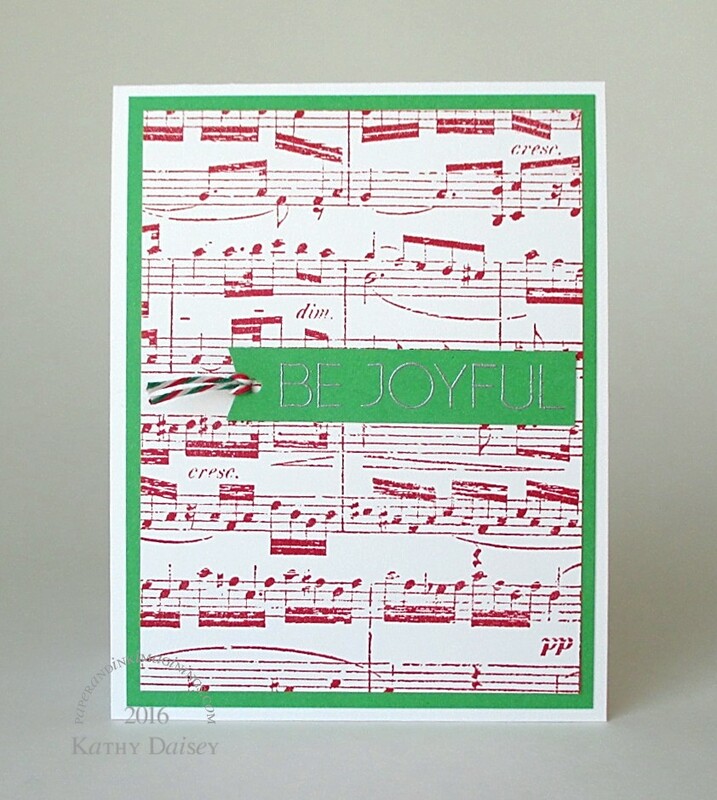 Why is sheet music so appealing us for decorative purposes, I wonder?! I’ll save the music clip for later or it will be in my head for the rest of the day. I love those films! I do find sheet music to be very artistic. I don’t play an instrument or sing (other than the shower or with the car radio), I don’t read music well. I used to be able to read it (piano and violin lessons as a kid) but I don’t think I could now, strangely. It should be like riding a bike, but I don’t think it is! Oh, I bet you would pick it up very quickly if you started again…quicker than I would learning it for the first time. Let’s hope I don’t need to prove that theory in some kind of emergency situation! Aw, pretty card! So bright and cheer filled. And yes … I too think of that song in Sister Act …. and now … I have gained todays earworm! eek. Thank you, Cobs! Sorry for the ear worm, but at least it is an upbeat song! Love this background and how you created a label in a shape of a tag with this twine! Looks very nice!